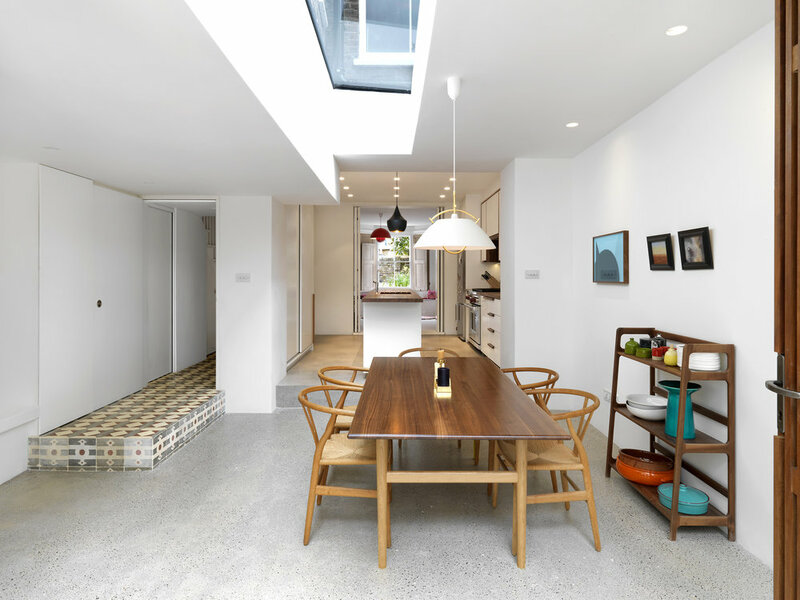 The project involved the extension of the lower ground floor of a Victorian terraced house on Farleigh Road. The clients wanted to expand the lower ground floor level to create a more sociable space centred around the kitchen (one of them used to be a chef so much of life centres around cooking and entertaining). The extended space creates a more fluid relationship with the garden where they spend as much time as the weather permits, cooking on the barbecue and being outside. The response was a carefully considered extension to the side and the rear, which wraps around the existing rear volume of the house. This existing volume is allowed to 'hover' into the new space. A bespoke polished concrete floor extends from the kitchen at the heart of the house, out into the garden, creating a seamless space through materiality. Externally the concrete folds up from the ground to form an external cooking worktop on one side and a low bench on the other, which catches the sun in the evening. A cast in-situ shuttered concrete wall forms a division between two different spaces within the new extension; one is an intimate seating area with a bay window which opens up to the exterior concrete bench, and the other a new dining area which opens fully to the garden via a large pivoting timber framed door. The palette of materials was also carefully considered - the warmth of iroko timber combined with the rawness and texture of the concrete wall, and the polished concrete floor with black aggregate chippings, off-set against the decoration of the encaustic tiles reveals an approach which is less precious about style and more focused on the integrity of the materials used.